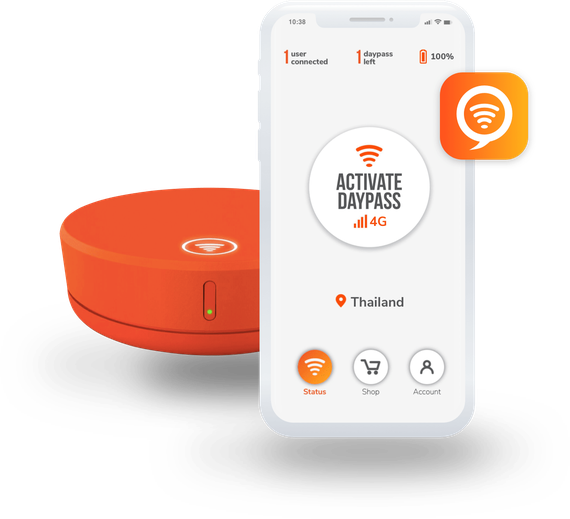 Easily manage your Skyroam Solis account, buy service, check data usage, and status. You can also get Access to enhanced features such as smart troubleshooting. If you have an iOS smartphone, visit Apple’s app store and type in 'Solis WiFi'. If you have an Android smartphone, visit the Google play store and type in 'Solis WiFi'. I do not have a Skyroam Solis hotspot, can I use the App with other hotspots? Our Solis App is only compatible with the Skyroam Solis hotspot. If you are a Skyroam customer with a different type of hotspot, you will not be able to use our Solis App. Do I need to create a new account on the Solis App if I already have an account on a.skyroam.com? If you are an existing customer with an account created already, you do not need to create a new account. You can use your existing account to log in to the Solis App. If you are a new Skyroam customer, you may create a new account on the Solis App by selecting “log in or sign up” button on the welcome screen. You may choose to create an account on a.skyroam.com too! My QR code scanning isn’t working. How do I register and connect? Once you are connected to the WiFi network, launch the app and on Step 2 of setting up, please choose "Connect Manually". Input the appropriate Skyroam Solis WiFi network and credential. You may find your Skyroam Solis WiFi network information on the back of the device. If you have any registration issues on our Solis App, please complete the registration on our web account portal at a.skyroam.com. Once you are registered, you can still manage your account on the Solis App by logging in with the account details you have created. *** Please be sure you are connected to the Skyroam Solis wifi network. How do I check my usages on the Solis App? Please visit the ‘Account’ page. Under ‘Device Control’ category, you will locate ‘Data Usage’ section. Data usage page will show you your daily usages. Please select the ‘Shop’ page. Under the ‘Shop’ page, you will see a variety of options. Select the Daypass type you desired and check out. How to subscribe to Unlimited Monthly Subscription? Under the ‘Shop’ page, select the Subscription option. Click on the ‘Subscribe on Skyroam Portal’ option. Once you login to the online portal, you may subscribe to Unlimited Monthly Subscription. How to subscribe to "GoData"
Please select the 'Shop' page. How to apply Prepaid Code on the App? Please visit the ‘Shop’ page. Under the ‘Shop’ page, select the Prepaid Code option. How to see the amount of Daypasses remaining? On the upper right-hand corner, it will display Daypasses remaining. How to see what version of Skyroam Solis software I am on? Under the ‘Account’ category, select ‘Device Information’. On this page, you will see the version type, if you connect your Skyroam Solis.